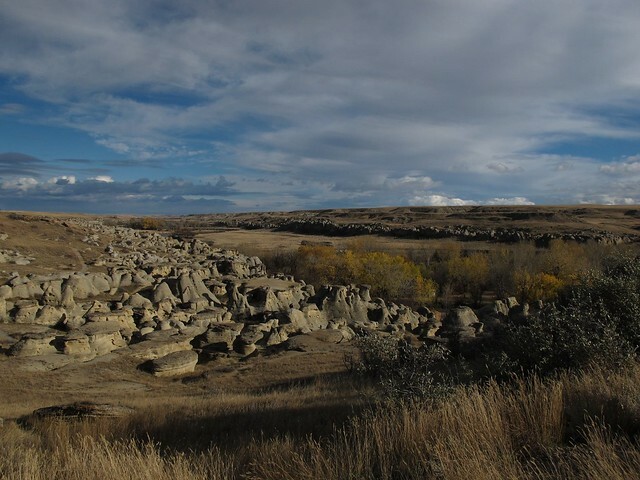 As some may remember, last autumn, I camped the better part of a week at Writing-on-Stone Provincial Park in southeast Alberta. I wrote about my visit here and here. This year, with the weather unusually warm, and the campground looking so beautiful beneath a golden canopy of cottonwoods, I kept extending our visit another day and then another and another. There were very few other campers aside from a few hunters who were absent during daylight hours. For various reasons, I did not feel much like hiking, so spent afternoons around camp, studying maps and working on a writing project. Each morning and evening, I would walk up through the hoodoo fields to a high spot overlooking the river and canyon, and send off emails to my family and anyone else who might have written. For those interested in technical stuff, neither the iPad or the Blackberry worked down at the campground on the cottonwood flats below the hoodoo field. Up above, I was able to get a decent signal on the iPad, but not a particularly good signal on the Blackberry. 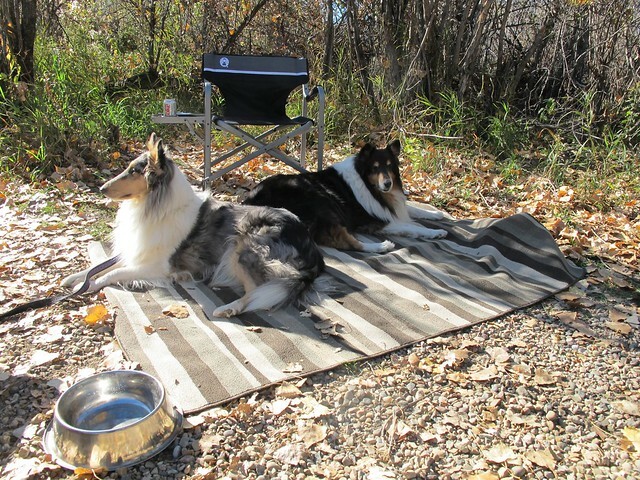 The dogs seemed to enjoy quiet afternoons together, interrupted only by the curious Magpies that flapped from perch to perch, emitting an interesting array of sounds ranging from tinkling chimes to the zizzing of sleeping bag zippers. Sage was quite fascinated. As was the case last year, I felt very tired and in need of a rest. It seems to be a cumulative thing that eventually manifests after the journey is finally underway. Last year, it was all the rushing to get the farm sold and dispose of or move our belongings into storage. This year, it was closing up the old house after this past summer’s work, then getting the van ready for our journey. By the time we get to the west, i seem to need a few days of doing nothing much beyond sleeping and making our dinners. The dogs were more than happy to oblige me by turning in early each evening. I used to be a dreamer, but now I rarely have anything memorable, which is probably just as well. For the past two years, any dreams that I had concerning Don were very disturbing – especially those that I refer to as The Hospital Dreams. 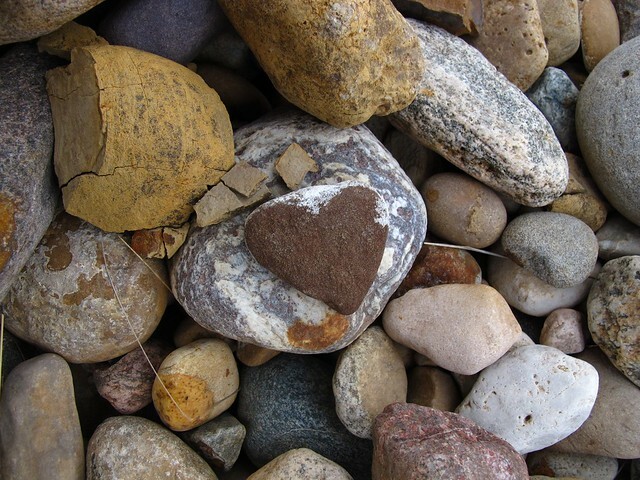 This autumn, while camped at Writing-on-Stone, i dreamt of him several times, but these were better – nothing extraordinary, but pleasant in a mundane sort of way. I hope this is the beginning of a new trend – no more nightmares. 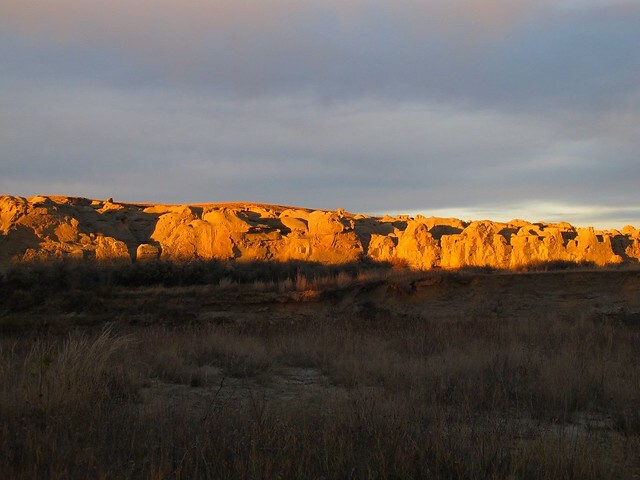 The area encompassed by Writing-on-Stone was, and still is, considered to be a sacred place by the Plains tribes. It was a region where people came to hunt game and gather wild foods, but was also considered to be a place of power where one might have dreams or visions. Perhaps the power to inspire dreams lives on in this place. Sometimes I’m asked why it is that I prefer being out here on my own in these wild places. Is it the solitude and quiet? Is it the beauty of nature? I have no real answer other than to say that I find it next to impossible to care about what constitutes our modern world anymore. What I see about me seems to be just so much chaff and so little substance. This year’s week at Writing-on-Stone seemed to reify all that I have been contemplating this past few years. For most of the week, the place was quiet and peaceful. I met a teacher who is on sabbatical for a year. We spent a good evening talking of many things next to her campfire. She told me of how her school has been planting a tree out front in memory of each teacher who has passed away from cancer over the past couple of years, and that she doesn’t want to be the next tree. She wants to spend some time doing those things she has always dreamed of doing – traveling and camping in special places. I believe she has made a wise choice. There was one day out of the seven which reminded me of why I can barely function within the modern world. On a Friday night, three groups of young people showed up at the campground. One group seemed reasonably normal, but one group shrieked and yelled no matter what they did – setting up tents, making dinner, jumping around up on the hoodoo field while shouting, “Duuuude! Hey, Duuude!” at the tops of their lungs. This went on all evening and began early the following morning. 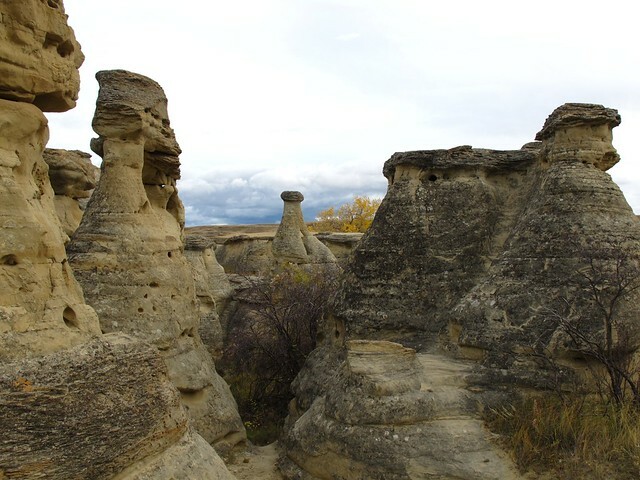 The third group set out with the paint guns making all kinds of bizarre racket as they walked through the campground to leap about among the hoodoos. In the course of a week, I walked up and down the traveled pathway through the hoodoo field below the interpretive center a good number of times. 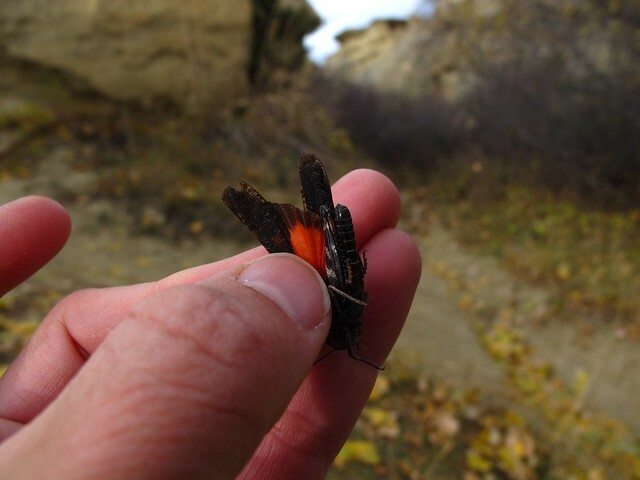 I took note of interesting rocks and the small scarlet-winged grasshoppers that catapulted across before me. I got to know how things looked. After the noisy crowds departed on Saturday afternoon, I took note of all the fragments of sandstone that lay crumbled along the pathway – some quite large. Chunks of stone that had not been there the day before. 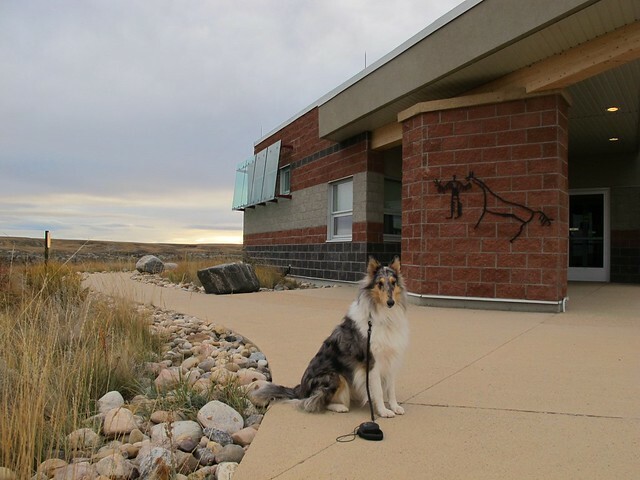 It made me feel sad and sick, and also made me think of one of the interpretive signs in the park which says something to the effect that Native peoples approach this place with respect, often leaving offerings such as tobacco or sweetgrass. Why is it that the people of our modern society have so little respect for these wild places? Why is it that we think it okay to leave our ugly cities and travel to these natural places to despoil them? How is it that we see the natural world solely as a place to exploit? Is this how most people think now? That the natural world deserves no respect and exists only as a playground and resource for mankind? Is our modern world really such a thing to be proud of? Toward the end of the week, the weather began to change. Wind and rain replaced the warmth and sunlight of the previous few days. The campground cleared out so that I was one of only a few left. The hoodoo fields now looked gray and gloomy – almost reproachful. I spend my final day getting the van tidied up and organized for the next leg of our journey. It had been a blustery day with occasional showers. I was feeling a little depressed after the previous couple of days of watching the goings-on around me. However, just as the sun began to sink behind the western hills, the cloud cover cleared and amber rays flooded the entire canyon, igniting the rock formations with gilded light for a few fleeting minutes. Weighty thoughts took wing and departed as I was reminded that, in spite of all that mankind might do, the land beneath is strong and true and will outlast all.